Nathalie David can vividly remember helping her mother sort plastic, glass, newspapers, and aluminum cans into bins, then going with her to drop them off at the local fire station for recycling. The practice made her feel good, even as a young child. David, 24, is an avid recycler. Today, though, she no longer has to drive to the local fire station. She can take just a few steps outside her front door in Richmond’s West End. Curbside recycling, which serves 249,000 households in six jurisdictions in the Richmond area, makes recycling easy. Since 1991, when curbside recycling became available in the Richmond area, more than 500,000 tons of material have been collected and recycled. For the fiscal year ending June 30, 2010, the CVWMA reports its second best year in collected tonnage, at 34,295 tons. While participation in recycling programs is voluntary for residents and businesses in Virginia, state law mandates that each local government implement programs to recycle at least 25 percent of the municipal waste generated each year. Curbside recycling generally serves single-family homes in the more populated areas, while convenience sites and drop-off centers are located nearly everywhere, including rural areas. In an age where headlines scream dire warnings about global warming and going green is hailed as the responsible thing to do, recycling is certainly on the rise. But not everyone agrees that it’s necessary or fiscally responsible. Spend time online, and you’ll find countless stories criticizing the government for mandating recycling. We aren’t running out of landfill space, recycling critics say, and we certainly aren’t ever going to be without trees. Author and economist Lawrence W. Reed wrote In a recent article published by the Foundation for Economic Education: “The fact is, that sometimes recycling makes sense and sometimes it doesn’t. In the legislative rush to pass recycling mandates, state and local governments should pause to consider the science and the economics of every proposition. Often, bad ideas are worse than none at all and can produce lasting damage if they are enshrined in law. Simply demanding that something be recycled can be disruptive of markets.” Reed goes on to say that recycling does not always make environmental or economical sense. Sometimes, critics say, recycling can cost more than simply discarding an item. And many times, items that are recycled end up in the landfills anyway. Most metals and paper products, Dunnavant said, are good for recycling because they are cost efficient to recycle and have value. They can be reused. But some plastics, he said, cost more to recycle than to throw away and have no value. “There should be thoughtful recycling instead of just jumping on the bandwagon and assuming it’s always good to recycle,” he said. Recycling, supporters say, not only helps the environment by keeping garbage out of landfills, but it creates jobs, saves energy and conserves natural resources. 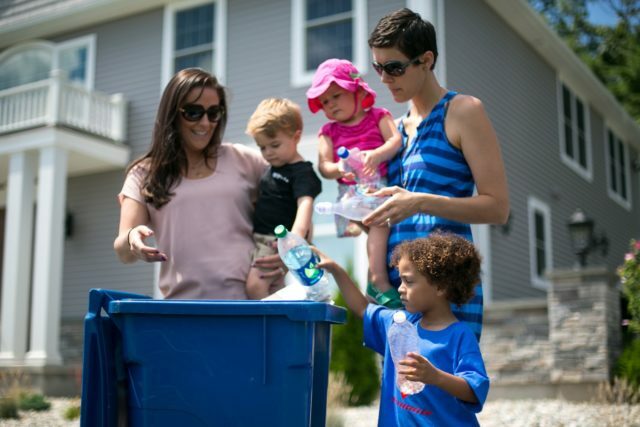 “There is so much potential for recycling…it’s not just curbside Recycling,” said Elli Sparks, a mother of two. Recycling can also help those less fortunate. Every time, for example, that you bring used clothing to Goodwill, you are recycling. The same is true when you reduce and reuse. “At our house, we compost almost everything,” said Sparks, a Richmond city resident who takes reusable bags to the grocery stores, makes her own shampoo, and reuses glass bottles. Nationwide, curbside recycling is available to about half the population, but less than 35 percent of Americans recycle. That figure is up from 17 percent in 1990. The rate for Central Virginia is 53 percent. Families can get their children involved by collecting books for literacy campaigns, bottles and cans for Habitat for Humanity, and aluminum can tabs for Ronald McDonald House. Commercially, denim pants can be broken down and reused for insulation, while recycled plastic bags make great decking material.